The proposal would help keep Colorado Springs parks clean while encouraging residents to move to a humane plant-based diet. According to Tracy Reiman, Executive Vice President of PETA, it’s a win-win situation. I am writing on behalf of People for the Ethical Treatment of Animals (PETA) and our more than 2 million members and supporters--including thousands across Colorado--regarding the recent report that Colorado Springs has removed the trash cans from its public parks because of a lack of funds. We would like to contribute some money to bring the trash cans back by paying to place an ad (attached) on them. The ads would read, "Meat Trashes the Planet. Go Vegan. PETA." This win-win situation would help keep litter in its place and remind those enjoying your city's natural beauty that the best way to stop trashing the planet--through overgrazing, deforestation, and the wasting of resources in meat and dairy production--is to go vegan. Millions of people are making a concerted effort to decrease their carbon footprint by reducing the amount of packaging and other trash. But many people simply aren't aware that the most effective change that they can make is ditching meat and dairy products in favor of vegan meals. In a major U.N. study, Livestock's Long Shadow: Environmental Issues and Options, scientists conclude that raising animals for the table generates more greenhouse-gas emissions than all the cars, trucks, ships, SUVs, and planes in the world combined. The report also points out that animal farming is "one of the top two or three most significant contributors to the most serious environmental problems, at every scale from local to global." In addition to trashing the planet, the meat and dairy industries cause untold amounts of animal suffering. Chickens, fish, cows, and pigs feel pain and fear, just as the animals we share our homes with do, yet they are abused in ways that would be illegal if dogs or cats were the victims. Chickens and turkeys have their throats cut while still conscious, piglets have their tails and testicles cut off without any painkillers, and mother cows have the calves they cherish taken away almost immediately after their birth so that the milk meant for them can be sold. 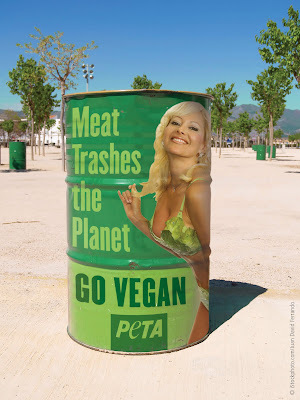 Getting PETA's ad placed on trash cans in your city's public parks would allow the city to restore this vital public service, spare the lives of countless animals, and help educate the public about the most effective way to "go green." Please contact me to discuss our proposal. Thank you for your consideration. Colorado Springs newspaper, The Gazette, gives the idea a thumbs up. Editorial Page Editor Wayne Laugesen writes, "Mr. Mayor, please call People for the Ethical Treatment of Animals. Call them and close a deal that could change the way we fund services in Colorado Springs." At TDIV we applaud PETA for trying to help the beautiful city stay litter-free while promoting a healthy, environmentally-friendly lifestyle. We hope the City Council will accept the organization's offer. Photo Credit: Thanks to PETA.